By Zack Quaintance — A difficult thing about a strong year for comics (like this one) is doing a retrospective Best Of list. Now, to be sure, no one mandates websites do rankings. That would be a clear violation of civil liberties. There is, however, a part of the pop culture blogger brain that goes wild for it, whispering all year long...where does this one rank...and if you don’t satisfy that beast—well, bad things happen. There you have it: guiding principles of our Top Comics of 2018. Now, without further adieu, let’s finish this bad hombre! The Immortal Hulk by Alex Ross. The first of the Big 2 titles to make my Top 5 Comics of 2018 is the Al Ewing and Joe Bennett-driven Immortal Hulk, a startlingly-blunt take on a long-time hero that reads more like a creator-owned book than a shared universe corporate story. We’re late in the superhero trajectory, with comics having constructed, deconstructed, and exported the concept to other mediums plenty. Our best modern stories are those that get closest to capturing a character’s core, and rarely has a title done this as well as Immortal Hulk. At the same time, this book has found a darker place that was always there, taking existing elements and extrapolating them so thoroughly they feel novel. It’s found ground not possible for the sensibilities of the 1960s, Hulk’s heyday. Both artwork and audience have evolved, becoming more sophisticated and thereby allowing Ewing, Bennett, and others to push Hulk further into monster territory while at the same time making Banner the emotional blank slate he was perhaps always meant to be. In this book, Banner is backgrounded, standing in for humanity at large as darker base impulses drag him places no one wants to go (ahem, hell). The Hulk is not the hero—that honor goes to anyone who can live a contented and peaceful life. On the surface, this comic has also benefited from consistent artwork from Bennett who has needed few guest replacements, plus early chapters that provide satisfying narratives independent of what came before or will come after. This is a bit of a lost art, but still very much welcome, and it’s something that Immortal Hulk did expertly. 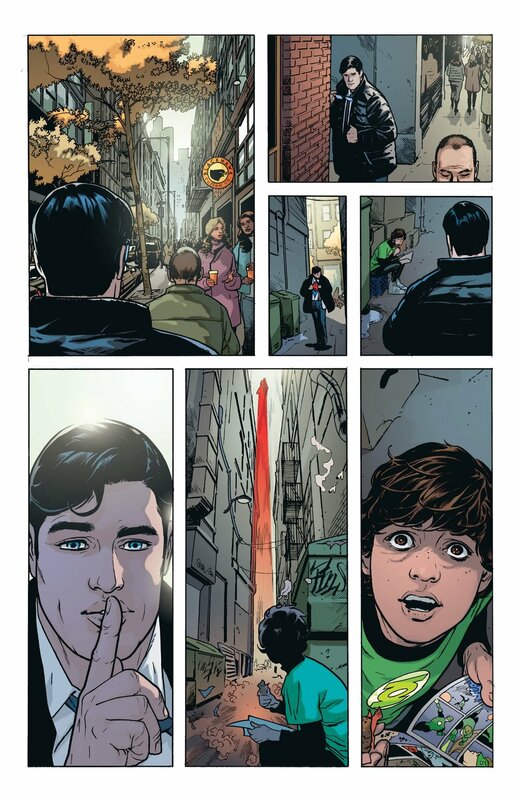 This gem by Ryan Sook and Brad Anderson from Action Comics #1006 is quite possibly the comic book page of the year. In 2017, Brian Michael Bendis—a leading voice at Marvel Comics for almost 20 years—announced a jump to the distinguished competition, leaving fans with questions that ranged from whether Bendis could thrive there to which titles he would take over. Some suggested this would spark a creative rejuvenation for Bendis, a chance to recapture energy from bygone days. Here’s the thing, though: Bendis had quietly been doing some of his best work at Marvel. Following the stumble that was Civil War II, his Infamous Iron Man, Jessica Jones, and Defenders titles were all excellent. This is my way of saying I predicted Bendis at DC would be successful. He’s generally praised most for early work on Daredevil, as well as for creating Jessica Jones and Miles Morales (who’s having a moment with new film Into the Spider-Verse). What gets lost is that Bendis is likely the most prolific comic writer of a generation, consistently producing three to five monthly titles and rarely (if ever) suffering delays. As I’ve written, part of what I love about comics is the deadline-driven schedules force creators to just do the damn work, to put forth ideas without belaboring them as one must in film or prose writing. When it comes to embracing child-like excitement, love of comics history, and just doing the damn thing—Bendis is the best. Still, even I didn’t predict what he’s doing with DC’s Superman titles. Flanked by the best artists to work on the character in decades, Bendis is telling a story that breaks this hero and his mythos down to its core before (seemingly) building it back up with slight tweaks for 2018. His Action Comics, Superman, and Man of Steel miniseries have all felt both classic and progressive as he revels in iconic stature while viscerally having a blast using the DC Universe that’s been off limits for so long. The end result is that both Action and Superman continue to rise, as satisfying as they are epic. From Monstress #18. Artwork by Sana Takeda. This was the year of Monstress, with Marjorie Liu and Sana Takeda’s expansive creator-owned fantasy hitting big at the Eisner’s and (presumably) finding a much larger audience. For fans of the book from the start, it was incredibly rewarding to see this story get its due. Liu’s world-building is phenomenal, drawing loosely from traditions while first and foremost exploring original elements. 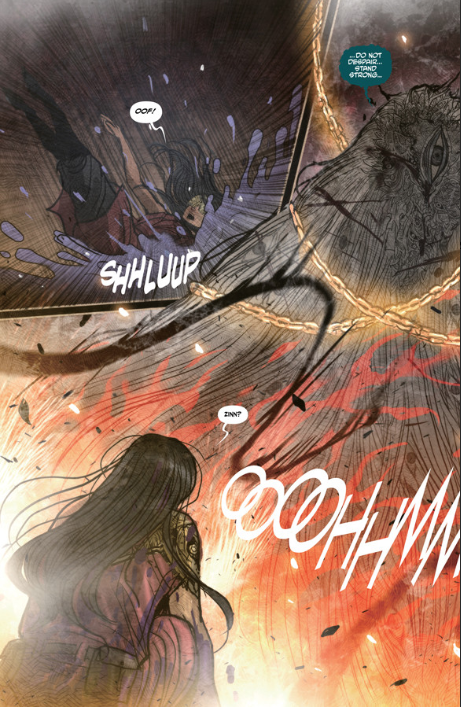 Takeda’s artwork, meanwhile, is second to no artist keeping as regular a release schedule (save for possibly the great Fiona Staples), with an intricate manga-influenced look that makes every panel of Monstress feel like the product of months of design work. This year saw Monstress play out its third arc, a grandiose story heavy with confidence. The world-building continues, but it’s not as noticeable as it was in earlier arcs (both of which were also phenomenal, btw). The real focus of the story now is the journey of the main character. Given this is a fantasy comic (the fantasy comic of the decade), we wouldn’t have it any other way. What started as a revenge story in 2015, has grown into a powerful young woman reckoning with a range of life: her relationship with her history, with her mother, with the mysterious power inside her, with the most responsible way to use it, and with the repercussions for noble actions that grew out of a simple desire to escape oppression and survive. Black Hammer: Age of Doom, Quantum Age, Doctor Star, and Chtu-Louise. This past year also saw the establishing of a new superhero universe: Black Hammer. Technically, this homage-heavy universe was created back in 2016 with the advent of Black Hammer #1 from writer Jeff Lemire and artist Dean Ormston. That issue was the start of a specific story. The wider universe grew later, doing so with an adjacent miniseries that broadened the plot in 2016 (Sherlock Frankenstein and the Legion of Evil from Lemire and artist extraordinaire David Rubin). In 2018, however, we got an even broader expansion. This past year, the Black Hammer universe continued with its main title, while adding two more miniseries and a one-shot. Add to that all kinds of rumors about what’s coming in 2019—from Lemire himself writing/drawing a 12-issue series, to a crossover between Black Hammer and DC Comics—and all signs point to this universe being here to stay. I had a chance to interview Jeff Lemire at San Diego Comic Con, and he agreed, saying as much. I point this out as a way to note Black Hammer is so well-done that it has found a strong foothold in a market over-saturated by superhero concepts since basically 1970 (if not sooner). This is Lemire in all his brilliant Lemire-ness, following his deepest ideas and tragic lonesome sensibilities. He’s created a tone that allows him to write a few pages of funny before lapsing into full-blown meditations on the nature of generational comic book stories. Shared superhero universes function best with a strong guiding voice or perspective (see Marvel in the ‘60s). Black Hammer is doing just that, and I for one feel lucky to experience it in real time. Saga #50 (cover by Fiona Staples) finds the family in happier times. I’ve written about this often, but it’s easy to take long-running creator-owned comics for granted, forgetting what a rare thing it is to have talented writers and artists string together wholly original stories with only their keyboards and pencils. For many of us, our lifetimes have been marked with a mainstream comic selection dictated by corporations and distributors, plus whatever experimental work was on the fringes. In recent years, this has changed, and, leading that change, has been Brian K. Vaughan and Fiona Staples’ familial sci-fi epic, Saga. This year, however, was one in which we were all but forced to stop taking Saga for granted. The first reason for this was Saga’s latest story arc (which ran in issues #49 - #54, and wrapped up in July) was obscenely consequential. I don’t want to give anything away, but $@#% goes down and it’s bad, so bad I wrote about why it hurts, partially to make sense of why I was so devastated. It’s a testament to this story that it can hit such intense emotional beats so far into its run. Second, the book announced it would be going on a year-long (minimum) hiatus. Obviously, you can’t take something for granted once it leaves you. Kind of bummer (we’re compensating with a year-long Saga re-read), made all the more bumming (is that a word? ah well) by how good the comic got before the announcement. There really is, quite simply, nothing else like Saga, not in terms of the scope of the story, the artful thematic explorations undertaken within, or the industry-best action and design graphics generated a whopping six times a year (or more!) by the massive talent that is Fiona Staples. This site is dedicated to discussing comic books in thoughtful and analytical ways as the medium enjoys a new golden age. To us, Saga remains the leader of an ongoing renaissance, and a big part of the reason we think it’s so important to volunteer time to cover the artform. It is an absolute honor to give the book and its devastating 2018 story (kind of fitting, in sooooo many ways) our Top Comic of 2018 honor. Check out Best Comics of 2018, #16 - #25 and Best Comics of 2018, #6 - #15! And check back later in the week for more year-end lists, including our Best Single Issues and our Top Creators of 2018! Black Hammer: Cthu-Louise is out now. By d. emerson eddy — For a few years now Jeff Lemire and Dean Ormston, along with a host of other talented collaborators, have been building a universe at Dark Horse in Black Hammer, founded on a deep love for Silver Age comics, paying homage to many of the characters and characteristics of that era. The series began as a kind of mystery about the disappearance of a Justice League analogue, but quickly spiralled out into spin-off series, including a far-flung future with teen heroes and a focus on one of Black Hammer's arch-enemies and his legion of villains. It was in this spin-off, Sherlock Frankenstein & The Legion of Evil, that we first met Chtu-Lou, and his cute little daughter, Cthu-Louise. While the homages to the Silver Age Justice League, Legion of Super-Heroes, Legion of Doom, Vertigo, and beyond are wonderful, reading through The Quantum Age #5 this week as well got me wondering if the Black Hammer universe would work as well without the pastiches and homages to DC Comics. For my money, yes. I actually find that the non-homage, original characters and story elements are even more impressive. Such is Black Hammer: Cthu-Louise, a one-shot from Jeff Lemire, Emi Lennox, Dave Stewart, and Todd Klein. This story plays hard into one of Lemire's favorite themes, the importance of family, but it does so from a unique perspective. Louise doesn't have a loving family. Her father, Lou, was a super-villain, and now is just a lazy, abusive father taking out his frustration on his relatively innocent daughter, who is only looking for love and acceptance. Her mother is absent most of the time, working, but is equally emotionally abusive to Louise. When you add the problems she has at school due to her monstrous appearance, Cthu-Louise doesn't have an easy life. But she does have her “grandfather”, the elder god who granted her father his powers and thereby hers, and it's interesting how Lemire massages this into an “Eye of the Beholder”-type story. Lemire's Plutona collaborator, Emi Lenox, handles the line art for this story and, combined with the greens and purples of Dave Stewart's colors, presents a fairly light-hearted, cartoon-like style. It works well for Louise's age, giving it a colorful, deceptively-simple appearance, covering the darkness beneath the surface. On top of that, the lettering from the legendary Todd Klein adds overall to the feel of the story, giving us some unique fonts and word balloons for Cthu-Louise, Cthu-Lou, and her grandfather. It's particularly interesting the gradation of the word balloons that the style of Cthu-Louise and Cthu-Lou's is about halfway between the normal human balloons and that used by her grandfather. It's a subtle way of showing that Cthu-Louise is an intermediary between normal and the beyond. Overall, this is an excellent comic that shows the possibilities of the Black Hammer world outside of the main narrative, that the universe itself has legs of its own, and that the characters within it can carry a story without necessarily working within the meta-narrative of Silver Age homage and nostalgia (even if Cthu-Louise herself is a twist on a Lovecraftian pastiche). Lemire, Lenox, Stewart, and Klein give us a story that stands on its own tentacles.